Are you colorblind? Do you have any sense of style? Not sure how to decorate an apartment? Well, don’t be afraid, help is on the way. Here are 10 easy steps on how to decorate your apartment. Take measurements of the unit. Every square inch counts, no matter how large or small it is. This will help you find furniture pieces that are suitably sized. Take the surroundings into consideration. The color of the floor, and cupboards, and the walls just might be permanent. If the owner doesn’t allow modifications to his place, then you have to deal with it. Familiarize yourself with how to highlight those features. Try including items that compliment what you have. Think of one or more themes, and have subtle reoccurring hints of them. For example, use a pattern on a rug, and also on an accent pillow on your couch. Then, add more, like different trimmings in the same tone. Enhance the lighting if necessary. Lamps need not be bought in pairs; you can mix and match them, but should have at least one similar aspect about them. They may not be the same color, but might the same shape, for example. Add art or other objects on the walls to dress them up. This is a great place to show off your own art work, or frame pictures that you have taken. Mirrors will make a space appear larger. Include accessories that characterize you, cultural symbols or pieces you picked up in your travels can make for great décor. Incorporate memorable photos in frames to personalize your place. Consider scattering candles and houseplants around, or in the corners. Light is needed for both. Sunlight is important for most plants, they thrive by windows. Candle flames illuminate a space, but safety is first, never leave one unattended. Flameless candles are more secure and still exude a seducing mood. Reduce, repurpose, and recycle. Reuse glass jars to store spices, buttons, or any kind of collection, or to contain grains. Recycle cans, plastic and paper. Repurpose things like cereal cardboard, cut them up and make little boxes for drawer organization. Wash, then refill finished wine bottles with clean water. 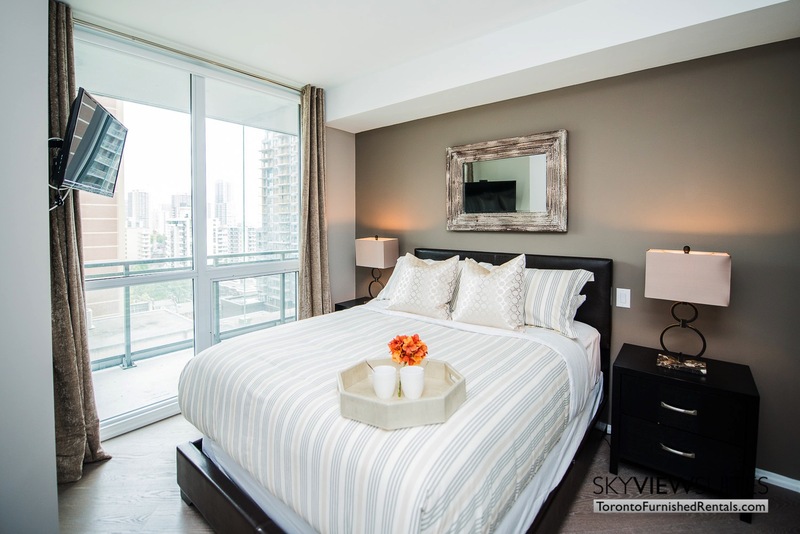 For more ideas on how to decorate your rental apartment, try staying at SkyViewSuites, or check out their website: www.torontofurnishedrentals.com to see how decorated rental apartments look.